Apr. 23 (Saturday): Walk Now for Autism Speaks. Join Team CSUN! Free bus leaves CSUN's lot G-3 at 6 a.m.; registration required for riders. Apr. 20 (Thursday): Unified We Serve hosts the UNIFIED4AUTISM carnival: 2-5 p.m., Plaza del Sol, USU. Free. Games, booths, music by "Arrest My Sister." Apr. 17 (Sunday): last chance to donate to CSUN's "Mile of Quarters" (USU Sol Center Lobby). Mar. 23 (Wednesday): Matador Involvement Center screens Temple Grandin (HBO), and a discussion led by two clinicians from CSUN's autism clinic. 5:30-8:30 p.m., USU Theater (in the USU above the Northridge Center). October 22 (Friday), 5 p.m.: "A Curious Night at CSUN's Bianchi Planetarium." Oct. 19 & 20 (Tues. & Wed.): Art for Change: United Sorority & Fraternity Council benefit for Autism Speaks. Magnolia Walk, CSUN. 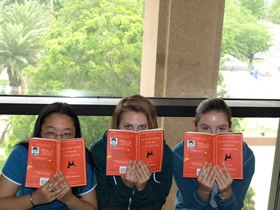 10 a.m.-2:30 p.m.
Aug. 23 (and continuing): Free Curious Incident bookmarks available for CSUN students (at the Info. Desk in the Library lobby) and faculty (email Cheryl Spector). This web page for The Curious Incident of the Dog in the Night-time by Mark Haddon was archived on June 1, 2011. 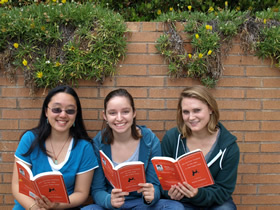 Please visit the Common Reading Home Page for information about events and assignments for the current year's Freshman Common Reading at CSU Northridge. Have a good idea for teaching with the book? Submit it for publication via the Assignments Blog. In Memoriam: Wellington. This campus-wide art project invites members of the campus community to decorate and display the distinctive silhouette of the dog Wellington (upside down, please, to match the bookmark and the book) on a bulletin board or other prominent campus space. (To request a silhouette or fmi: Cheryl Spector or x6535). Need inspiration, or want to brag about your own Wellington? Visit Wellington's photo blog. "Seeing is Believing: Visual Teaching and Learning." The NEA Advocate, February 2010. An Anthropologist on Mars: Seven Paradoxical Tales. Oliver Sacks, 1995. Animals in Translation: Using the Mysteries of Autism to Decode Animal Behavior. Temple Grandin and Catherine Johnson, 2005. Autism in L.A. Los Angeles Magazine special issue. September 2010. Autism: The Musical. Movie. 2007; this version, 2008. "Autism's First Child." John Donovan and Caren Zucker. The Atlantic (Oct. 2010). Big Bang Theory. CBS television series, 2007-present. Chaos: Making a New Science. James Gleick, 1986. (See Curious Incident p. 96 and also chapter 151. "First Autistic Presidential Appointee Speaks Out." Wired Science. Wired.com. 6 Oct. 2010. Forrest Gump. Movie. 1994; this version, 2001. Good Will Hunting. Movie. 1997. "Hidden Light: The Visual Language of an Autistic Photographer" by Steve Silberman. Online. 9 Feb. 2011. House Rules. Jodi Picoult. 2010. "How My Son Taught Me about His Autism." Joslyn Gray, Salon.com 11 Oct 2010. Look Me In the Eye: My Life with Asperger's. John Elder Robison, 2008. Three Rivers Press. "Memoir: On Spectrum: My Daughter, Her Autism, Our Life." Sally Tisdale. Harper's Magazine. April 2010. "Students, Meet Your New Teacher: Mr. Robot." Benedict Carey and John Markoff. New York Times, 10 July 2010. Temple Grandin. Movie. HBO, 2010. Five Emmys. 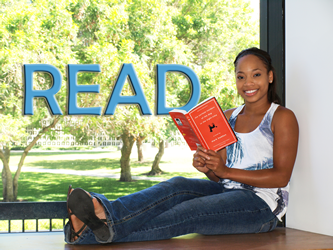 Available for checkout from the Academic First Year Experiences Library at CSUN: x6535 or visit CIELO, Sierra Hall 4th floor "rooftop" corridor. Thinking in Pictures: And Other Reports from My Life with Autism. Temple Grandin, 1995.